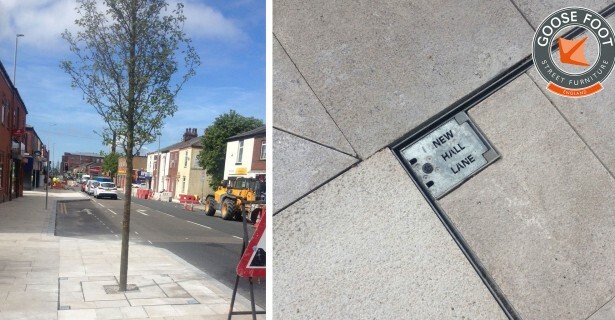 We were approached by Lancashire County Council to manufacture 11 bespoke tree grilles for New Hall Lane, Preston as part of the City’s regeneration scheme. Specification from the client was to manufacture the 1800mm x 1800mm x 80mm grilles from 3mm pre-galvanised steel. Formed into a patterned tray to house shaped paving stones, the tree grilles manufactured in-house incorporate 10mm wide channels for drainage, integrated lifting points to allow for removal of the grille for tree ‘guying’, and a hinged lid to allow for irrigation. 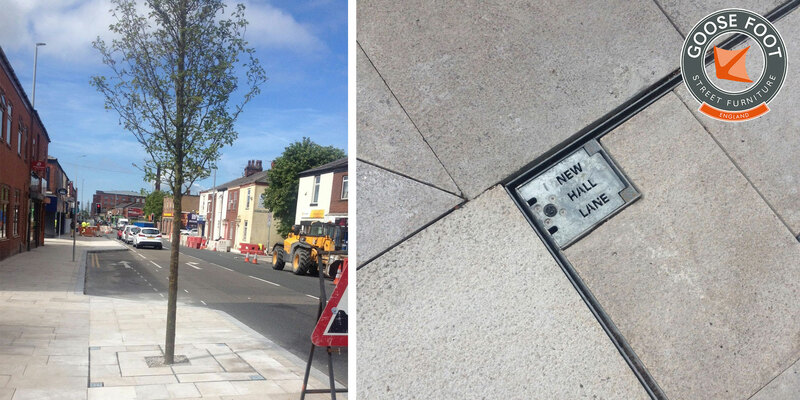 To add a personal touch to the project, the irrigation lids were laser cut at our facility to feature the words ‘New Hall Lane’ as a way of providing the local residents with a degree of ownership of the new trees and tree grilles. Available in a wide range of shapes and sizes to suit your specifications, Goose Foot specialise in the manufacture of bespoke tree grilles with intricate laser cut designs. They are available in stainless or mild steel and can be powder coated to any RAL colour. Custom logos and shapes can be integrated to match any urban realm regeneration scheme. With over 30 years’ experience in the industry, Goose Foot is widely recognised as the go-to steel fabricator of street furniture solutions for urban realm and regeneration projects across the UK’s public and private sectors.